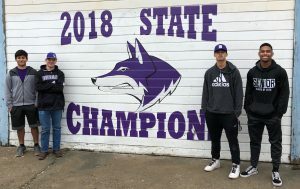 Not that anyone living in Denair is ever likely to forget, but there now is a vivid reminder on a busy downtown corner of the community’s state championship football team. Last week, four players from that team worked with Denair High art teacher John Stavrianoudakis and Denair alum Hector Obando to design and paint a mural on the side of a former gas station at the corner of Main Street and Sante Fe Avenue. A purple Coyote mascot’s head is bracketed by the words “2018 State Champions.” It is visible to anyone driving near the busy intersection. It is just the latest way to commemorate Denair’s amazing rise in football last fall. The Coyotes (12-1) – whose only loss to Ripon Christian cost them the Southern League title – crushed everyone in their way once the Division VII playoffs began. Their historic streak culminated with a 42-14 victory over Santee of Los Angeles for the state title. It was at that game – played before a partisan, purple-clad crowd at Jack Lytton Stadium – that the idea of memorializing the spectacular feat came to Denair businessman and Coyote booster Bob Holloway. The painters were Carlo Morales, Steffin Winston, Elvis Silva and Austin Richards – all current or former students in Stavrianoudakis’ art classes. But before they could get to work January 10, Stavrianoudakis and Obando first had to use a projector to sketch the outline of the mural in pencil on the side of the wooden building. They battled dew in the morning, glare during the middle of the day and then fading sunlight later, but finally accomplished the task. Then, it took nearly a full school day to complete the project. Denair Superintendent Terry Metzger said it’s just another example of the community spirit that makes Denair so special.